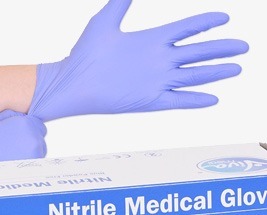 Nitrile gloves are manufactured from synthetic rubber with superior strength to Latex and Vinyl. They are strong and durable, offering a similar performance level to Latex gloves, with the added benefit of being suitable for those with latex allergies. They have high resistance to tearing and chemicals and are suitable for higher risk tasks. Available in a variety of sizes.